When it comes to products coming out of Detroit, most turned their noses up when something with the word “automatic” came on the scene. Nowadays, those manual gearboxes are going the way of the dodo (or will we simply call it the CVT crisis?) When it comes to watches, though, many a-folk is pretty happy to hear automatic. 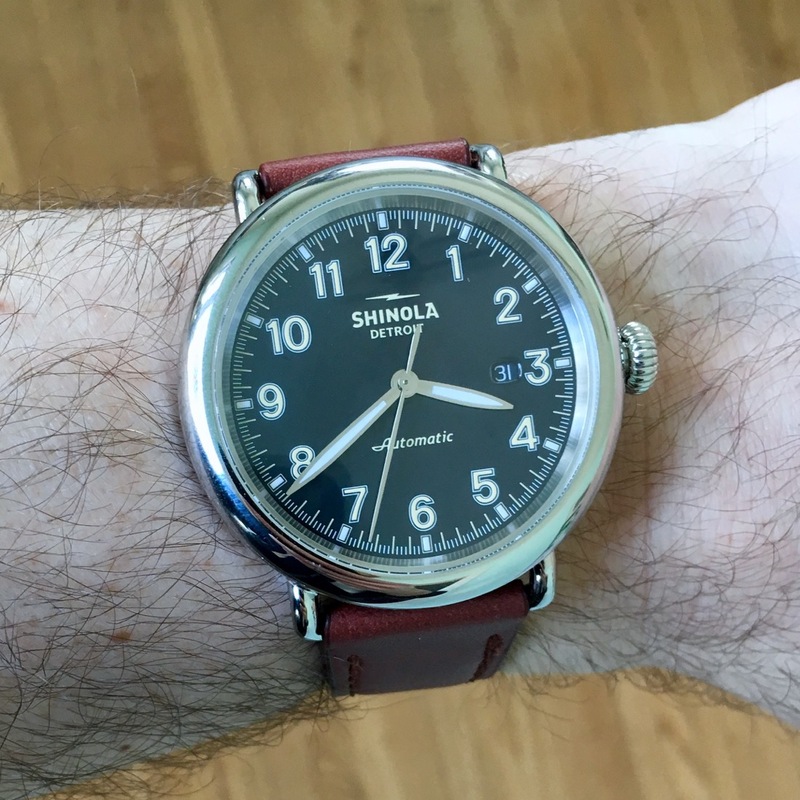 So, for those folks (and me), we’re happy to here about the new automatic Shinola Runwell. Now, in many ways, I could simply point you to any trusted review of the quartz Shinola Runwell that preded this model. Say, this one. But since we’ve not actually reviewed the three-hander on our site, we’ll tackle this one fresh. Shall we? The Shinola Runwell has been one of the most popular designs for the brand, showing up in a variety of sizes, dial treatments, and even making the leap to wall and desk clocks (which we reviewed here). And looking at the dial, you can see why. It’s a fairly basic three-hander with date display, paired with Roman numerals going around the compactly-hashed track. While it’s recognizable, they played around with the elements and fonts a bit to make it their own. So, same, but different. Likewise, Shinola mixes things up – and gives things an older feel – by going with the look of wire lugs on the case. This also helps to slim down the look of the watch, as you’ve got less bulk extending off the case to the strap. Until now, much like a vast majority of the Shinola watches that preceded it, the Shinola Runwell featured Ronda movements. These are movements that are assembled in Detroit, and then built into the watches. If you’re going to have a watch that looks older than it actually is, why not go with an older technology for the movement? In other words, it was time to slip an automatic in. We’ve seen some new designs leverage them (such as their diver), but this is the first time we’re seeing an existing – and well-liked – design get the movement change. In this case, the Shinola Runwell as the Sellita SW200 taking up residence. If you flip the watch over, you’ll see a small exhibition window in the caseback where you can see the balance wheel, and the rotor when it spins around. As with the Shinola Vinton, I am sad to see the caseback “coin plaque” disappear, but it’s sort of engraved into the caseback. On the reverse side, you can also see the block that was built up on the side – by the crown – to provide the support for things when the crown is pressed in. This part of the case just feels jarring to me. Everything else is graceful curves and circles, and then you have this steppe jutting out from the side. Fortunately, it’s not as visible from the top side, but I think the designers could wrap this in a bit more gracefully. It is also worth noting that the leather strap that the Shinola Runwell comes on is quite plush. It’s thick, but supple, and fits on the wrist like a treat. Not an overly strong leather scent, but it fits in line with the high-quality leather products that the brand is designing and producing in-house (saw some of that in my tour). Now, should you not care for the leather strap, there is also a bracelet option as well. And, you know my mantra – if you can afford it, get the bracelet now, and worry about leather straps down the road. Much easier to find those in the aftermarket than a bracelet. So, the question a prospective customer needs to ask themselves is this – is the price premium worth springing for the Swiss automatic movement? A quartz version in a 41mm case will run just $550, whereas this new version (in a 39.5mm or 45mm case) with the Sellita SW200 in starts at $1,095, while the bracelet adds another $200 onto the balance. So, yes, you are into the realm (or at least on the border of) thinking about luxury watch pricing. And at the end of the day, that’s not a decision I can make for you. To me, the pricing feels perhaps a bit ambitious, but inline with what we’ve seen on their other automatic watches. Perhaps if this takes off, we’ll see the price drop, or get things like chronometer-certification at the existing price point. Would I wear it? Do you even have to ask? I mean, it’s no Brakeman, but it’s a close second. The best thing about it: It’s showing some growth in what the brand is trying. And the deep blue dial on our loaner was a treat.